I have been base building for the last 5-6 weeks, steadily increasing my weekly mileage. The girl with fazed ponytail relentlessly popped in each of my sojourns to my FB wall during the last couple of weeks. Notice the "Special Prize: Finish 10K in 40 minutes or less and win a Kalenji's Run comfort grip running shoes worth 3999/-"
I succumbed, and despite no speed work since Nov, I clicked on the "Get Tickets" and paid up. I have been reading "How Bad Do You Want It? Mastering the Psychology of Mind Over Muscle" and what better time to try this than now. I ran some 1k intervals on Wednesday and it went alright. I started out a 10k tempo on Thursday, but gave up quickly. Ok, this will have to be Mind over Muscle on race day. I'm one of the first ones (even before the staff) at the appointed 5am at Decathlon, Ok. There is no timing chip in the bib, Ok. There are some 10-20 pro-elite looking guys, Ok. After all, I am only competing with the clock today. There is some buzz around "shoes for the 1st guy" or "shoes for every sub-40 guy". I have read the terms correctly. Ok.
Run starts 15mins later than the scheduled 6AM start. Ok.
My laces come off, I lose a minute, struggle to keep pace on the flat course along country roads, U-turn comes in 19:11, still in contention. Ok.
Pace falls to 4:11 or so for the next few kms, push myself to finish in 39:08. Course shorter by 400mts. Ok. I run some more, pick up my medal & certificate and inquire with the organizers, "when do i pick up my shoes?". "Did you win? No? Shoes are only for the top finisher" NOT Ok. NOT Ok. NOT Ok. The next 39mins was the true test of endurance. Decathlon had clearly goofed up the instructions that went to their communications team. 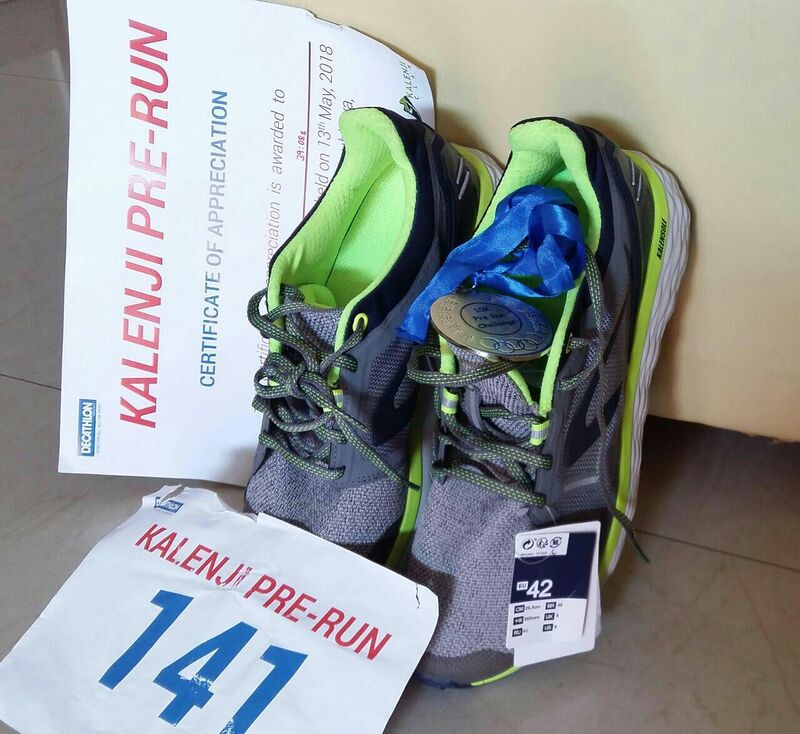 The FB page didn't mention the fine print - "Note: In case of multiple sub-40 finishers, shoes will be awarded to the top finisher". This after-thought-condition, seemed to be updated only on the Decathlon events page and not on FB. This Decathlon is in Chikka-jaala, translated in kannada, chikka = mini, Jaala = web / maze, coincidence? I had to use all the pervasive techniques I have picked up (esp. as a dad), pushy at times, playing dumb at others, throwing my weight while saying i didn't want to throw my weight, etc. There were some athletes who had come from Haryana on a general compartment train ticket, to run this for the shoes. There were other local aspiring good athletes as well, some 10 of us under 40mins. It helped my case. Then finally, after the n-th huddle, (by which time the 5 idlys had settled down), the organizers relented and pointed to the shoes in the running aisle. I picked this up, before the others got there. As, I left there, I overheard in hindi, "Do hazar ka, do le sakte kya?"